Open Invitation to the UKAPU AGM! It’s been just over a year since UKAPU’s last AGM and finally we’ve been informed of their next meet up. Ultimately, this is the perfect opportunity to get YOUR VOICE (as a player) heard. 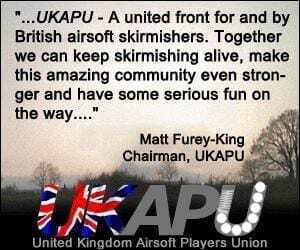 UKAPU stands for United Kingdom Airsoft Player Union, a FREE to JOIN, non profit, voluntary association made by players, for players. 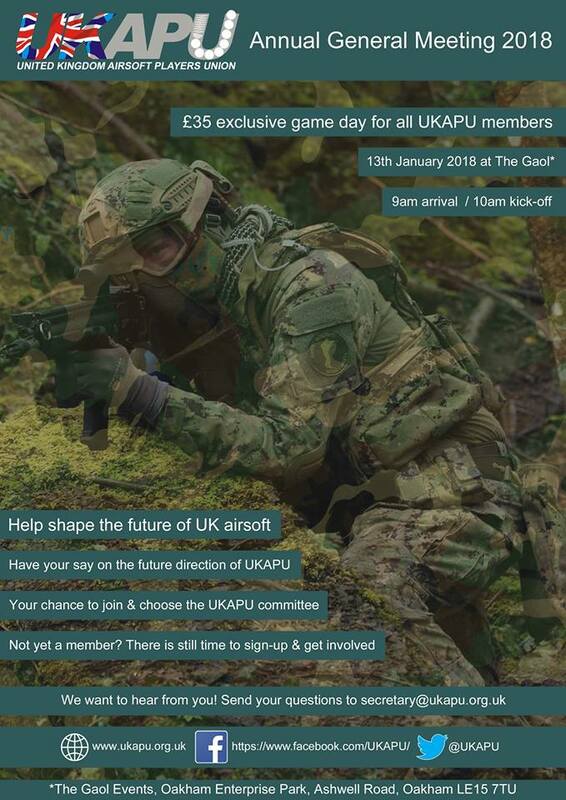 Their objective is simple, fight for the future of airsoft as a collective group of airsofters to ensure the ensure appropriate lobbying, information and messages get out. As I said, they’re all volunteers and the entire association is completely transparent. Just take a look at their website to see the minutes from meetings, previous campaigns they’ve supported and the current objectives that they’re trying to achieve. Anyway, each year they hold an AGM – Annual General Meeting. This is done as part of the process of running an association, discussing the main policies, finances and hot topics. This year will be David Weston’s first AGM as Chairman and it should give a huge insight into how 2017 has been (since we survived the Police & Crime Act), the future of UKAPU, and what the future holds in the coming 12 months. On top of the AGM, they also run half a day shoot – after all, we’re all airsofters! This year the event is going to be held at The Gaol, in Oakham. If you’ve not played there before, it’s an old Prison Wing with plenty of CQB action. Note: You must be a UKAPU Member, You can Register for FREE here. Together we are Stronger and by attending the AGM you are showing your support. Finally, come meet me! I’ll be there like last year to support UKAPU and get to see what I can do to help in 2018. It’s also about time I go play at The Gaol! Let me know if you’re coming along!